If you own your own home then you’ll know how great it is to be able to come home to your own personal, private space. The same concept applies to wildlife as well. If you have wildlife in your garden then it’s important that you do everything you can to give them a home as well, and by doing this, you can encourage even more wildlife to come right to your door. You don’t need a large garden in order to have a lot of wildlife. In fact, even the smallest of gardens can offer a huge range of wildlife the basic needs that they have. It’s great to be able to create a ton of habitats, but at the end of the day, you don’t want to cram everything in. Think about the space that you have and focus on making microhabitats the best they can be. If you think about it then lawns are great if they have uncut grass, because this helps insects to thrive and this is an ideal food source for hungry birds. If you have borders that are full of flowering plants then this will provide food to butterflies, bees and small mammals. Ponds and water sources are also ideal, as they can provide birds with bathing opportunities and they can also help amphibians to create a home as well. Your garden could be home to hundreds of creatures right now and you may not even know it, and by putting the work in, you could help to make it a home for hundreds more. If you want to encourage breeding and provide shelter for your wildlife then climbing plants are ideal. You can have these against your walls and they are great for birds. If you have a lot of trees and bushes then hedgehogs love these, as it provides them with shelter and even a safe spot to make a nest as well. This really is invaluable to their survival. If you want to focus on insects then note that butterflies need a place to breed as well. Hedge garlic is great here, and if you want to step things up then consider having some buckthorn bushes as well. This will really encourage these beautiful creatures into your home. Of course, you may not want to have areas of grass growing wild, and this is completely understandable, but one thing that you can do is avoid cutting back the borders to your garden. This will help insects and other creatures to have some shelter during the colder, winter months. If you want to get some help with your garden then companies such as ABC Home & Commercial Landscaping are ideal and they can really provide you with the support you need when it comes to your wildlife. 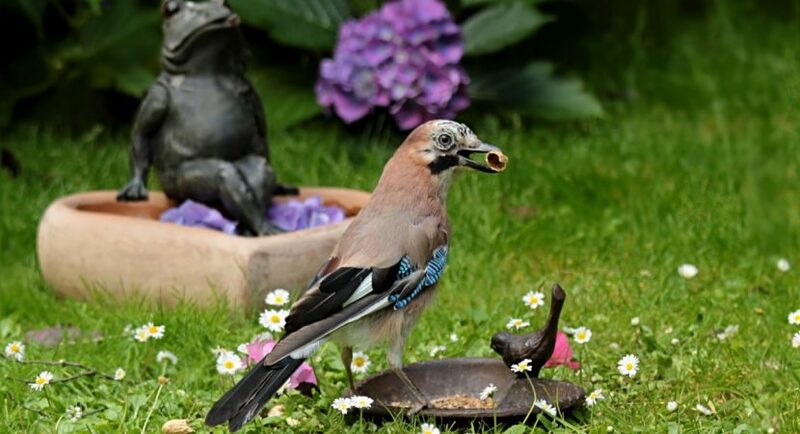 Another essential feature of your garden is to make sure that the animals you have can feed. It’s very easy for you to provide them with food sources, and flowers are great for this. If you have them growing throughout the year then this is a great way for you to encourage them all-year round. If you have berry bushes or even ivy then this can provide autumn nectar and even very late winter fruit, which is crucial for birds. At the end of the day, if you are able to provide a home for insects then you will also be providing foraging opportunities for birds and they can then survive throughout the winter. It’s also important that you have plenty of water pools as well. You really don’t have to have a pond to do this, and a small bowl will do just fine. You can replace the water often and this will really help your garden to become a wildlife haven. The problem that a lot of people have is that they disrupt the homes of the wildlife in their garden because they have no idea what their home looks like. For this reason, it helps to familiarise yourself with the various homes that wildlife have, such as hedgehogs, birds and more. When you know what their homes look like, you can then avoid disrupting them. This will really help to keep them happy and healthy, not to mention that it could even encourage other generations of wildlife to come to your home as well. This can really get you on the right track when it comes to your project and it could help to save lives when the winter season comes along.